Enriched with Dead Sea Mud & Minerals. Pampering and Gentle for Glowing Skin. Minerals of Eden body-wash blends 26 unique minerals with rejuvenating Ginseng to provide a deep-cleansing action while maintaining the natural balance of your skin. Enriched with naturally occurring therapeutic Dead-Sea mud, this special formula will leave you fresh, invigorated and moisturized. Water (Aqua), Sodium Laureth Sulfate, Cocamidopropyl Betaine, Ammonium Lauryl Sulfate, Sodium Chloride, Anthemis Nobilis (Chamomile ) Flower Extrac,Calendula Officinalis Flower Extract (Phenoxyethanol, Glycerin, Sea Salt (Maris Sal/Dead Sea Salt), Silt (Dead Sea Mud), Tocopheryl Acetate, Panax Ginseng Roots Extract, Macadamia Ternifolia Seed Oil, Argania Spinosa Kernal Oil, Fragrance, Dehydroaceticacide, Sodium Benzoate, Citric Acid, Iron Oxid. Pour a small amount of body wash onto a sponge or into your hands and gently massage into wet skin in circular movements. Rinse thoroughly. The best body wash on the market. Such a great product and the amazing smell makes you Stay in the shower for a very long time. You feel like you just came out of the SPA. Perhaps the world's best body wash! My skin smells and feels wonderful. It's just like being at the spa. I suffer from dry skin, and this body wash is the first of it's kind that doesn't dry out my skin. I'm Very satisfied. I'm spreading the word! Best stuff so far on the market. I received it yesterday and i used it this morning. You are absolutely right! It is awesome. 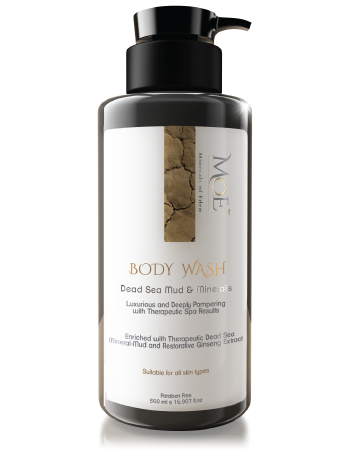 I had purchased the sea mud body wash for my father in law who has psoriasis and he absolutely loved your product. look forward to trying more of your products!